James Ross was born and raised in Montana. His interest in photography came when he was seven years old and was given a Kodak Brownie camera from his grandfather. Ross attended Montana State University and received a Bachelor of Science degree in Film & Television production in 1987. He also has a Master of Arts degree from California State University – Dominguez Hills which he received in 2004. 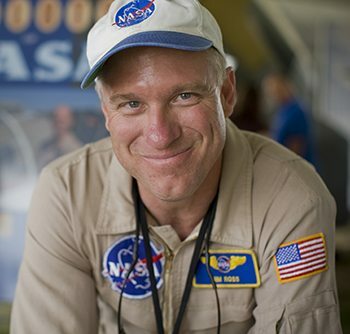 Ross began his aviation photography career in 1989 when he joined the photography staff at NASA Dryden Flight Research Center, now known as NASA Armstrong. He became the Photo Lead in 1997 and currently holds that title today. Ross has a Class A rating with NASA enabling him to fly in all NASA Armstrong aircraft. In his 27 years of flying, he has approximately 900 flight hours in many different aircraft including T-33, T-34, T-38, F-15, F-16, F-18, KC-10, KC-135, C-12, C-20A, Boeing 747-SP and various helicopters. Ross has been recognized by NASA on many occasions for his work and has received both the Public Service Medal and the Exceptional Public Achievement Medal. He also won the Best of the Best award from the Aviation Week & Space Technology photo contest in 2001. His work has appeared in many different publications including Aviation Week & Space Technology and Air & Space Smithsonian.